WHY SAND & SEAL YOUR WOODEN FLOORS ? 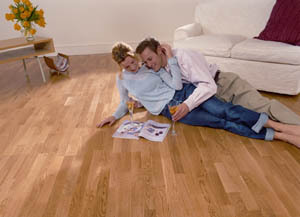 A new floor for your home? Laminates and carpets have their virtues - but genuine hardwood flooring still outscores these on many points. Hardwood floors are now being liberated from slumbering under wall-to-wall carpeting. A new floor is not cheap: at £80-£130 per square metre (installed), wood flooring is more expensive than carpeting or laminates that offer - on the surface at least - a similar look. When looked after, a wooden floor is a durable asset that lasts for decades. Indeed, some floors are still thriving after hundreds of years. When constructed from sustainable sources of timber, a wooden floor is the most natural and environmentally sound of all floor types. It is easy to repair, and may be restored for a fresh new look. Compare this to old carpets and laminates which have to be thrown away. Some scratches and minor damage are inevitable. Over the years, these are a reflection of good service: they add character to a floor and become part of its charm. Hardwood floors not only look inviting but feel warm and comfortable under foot: Laminates tend to feel cold and a little ‘plastic’. Wood is an excellent insulator, with its thousands of tiny air chambers per cubic inch holding in heat. Wood is the most hygienic of all floor types. Unlike carpets, its surface holds no refuge for mould and mildew – let alone dust mites which die from exposure to the air. Allergies are a growing concern among children – with pollen, dust and animal hairs all being implicated. It is easy to ensure a wooden floor is free of these potentially health-denying substances. Nothing could be simpler: a sweeping and mopping with warm water (and occasionally special floor cleaners) and your wooden floor will stay as good as new. No expensive carpet cleaning and wet carpets to dry. A wooden floor always impresses and is a great asset when selling a property. Estate agents surveys constantly confirm this – as do TV makeover programmes. A well-maintained floor will retain its value and can prove a worthwhile investment. Worn carpets could lower the perceived value. If you do have old carpets shrouding the potential of your floor, why not consider the modest cost of sanding and restoration? And forget about the expense of a new carpet. The main virtue is the one that has kept wood the top floor choice for centuries: they look so good - impressing your visitors and giving a sense of authenticity and worth to your home. And you can’t put a price on that. Your home is your getaway from the outside world. It should be a beautiful place that fills you with warmth, comfort, happiness, and memories. Hardwood floors can bring your home these feelings with their richness and natural beauty, unique textures, colours, patterns, and styles. Whether it is sprucing up an old hardwood floor or properly maintaining a new one, Bona understands the priceless importance of retaining the elegance and luxury of your floor. Bona’s quality, value, and performance give fresh and creative ideas to assist in decorating one of the most valuable investments in your home – your hardwood floors. From dust-free sanding and beautiful, waterborne finishes to easy-to-use products to protect and maintain, Bona provides an entire system of products to bring out the best in hardwood floors and ensure they last a lifetime.